Born in the late 1950s in Western Australia (in the area near what is now known in Australian/European settlement terms as Lake Mackay), Warlimpirrnga Tjapaltjarri’s birthplace was near a great expanse of salt lake close to the border of the Northern Territory. The lake, Wilkinkarra to the local Indigenous population holds great significance in the Aboriginal Dreaming of the Western Desert region. As a remote desert Pintupi, Warlimpirrnga’s experience of life in this remote region would later inform his painting with a focus on the “Tingari Cycle”. The concentric circles depict Tingari sites – Tingari the spiritual beings of the dreamtime - and highlight the linear structure with rows of dotting. From the Pintupi people who inhabited some 8000 square miles of desert country, Warlimpirrnga Tjapaltjarri was kin to the ‘lost tribe’ – the last Aboriginal Australians to be living a life untouched by European settlement. He came to painting later in life but quickly established both a local and international reputation as a serious artist. Tjapaltjarri had never had contact with westerners until he walked into Kiwirrkurra (WA) in 1984, one of the remotest places in Australia, 850 km west of Alice Springs. His arrival together with his family made world headlines as “the Pintupi Nine” and “the lost tribe”. Three years later, in 1987, he began painting for Papunya Tula Artists in 1987. His first eleven paintings were exhibited in a successful show in Melbourne in 1988; all were purchased by the National Gallery of Victoria in Melbourne. Warlimpirrnga has since appeared in many exhibitions including Mythscapes, National Gallery of Victoria, Melbourne in 1989; L'ete Australien a Montpellier, Musee Fabre Gallery, Montpellier, France; 1990; Friendly Country, Friendly People, Touring Exhibition, Araluen Art Centre, Alice Springs 1991; and Exhibition with Ray James Tjangala, Melbourne 1999. The catalyst for the establishment of Papunya where Tjapaltjarri first began to paint in earnest is significant. Following contact with European settlers, the Menzies Government of the 1960s forced traditional Pintupi Aboriginals to leave their lands and move nearer to Alice Springs. This was part of a broader policy of assimilation which effectively dislocated Aborigines from their traditional lands, spiritual connections, language, art and culture moving them to Papunya, 240 km northwest of Alice Springs in the Northern Territory. The displaced groups included Pintupi, which made up the largest language group, Liritja, Walpiri, Arrente and Anmatyerre people. Living conditions were appalling with almost one-sixth of Papunya’s residents dying in the first half of the 1960s of diseases such as hepatitis, encephalitis and meningitis. Despite this dark phase in the region’s history, Papunya entered a more positive era in 1972 with the foundation of the Papunya Tula artist’s co-operative. The name was drawn from the tula a small hill near Papunya, known locally as a Honey Ant Dreaming site. The group was exclusively made up of men and soon became famous globally for its “dot painting”. Under the tutelage of senior Papunya artists, Warlimpirrnga’s distinctive style quickly emerged. In 2000, he travelled to Sydney with a group of four men from Kiwirrkurra to make a ground painting at the Art Gallery of New South Wales for the opening of “Papunya Tula: Genesis and Geniu”’. In 2012, he was one of a small group of Australian artists to have work included in DOCUMENTA (13) in Kassel, Germany, while in 2015, his first solo exhibition in the United States was held in New York at Salon 94 in The Bowery. Today, Warlimpirrnga Tjapaltjarri’s work is highly sought-after for its abstract content and strikingly modern feel as well as its traditional Dreaming content, both in Australia and globally. Notably, Warlimpirrnga is the brother of artists Walala and Thomas Tjapaltjarri. He is also family to Yalti and Yakarri Napaltjarri also artists. 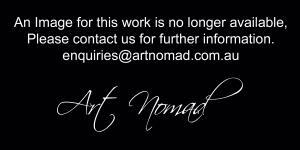 A committed painter, today he divides his time between Kiwirrkurra and Alice Springs. His work is represented in major collections in Australia and overseas including the National Gallery of Victoria: The Art Gallery of New South Wales; Macquarie Bank Collection, Sydney NSW; Kelton Foundation Collection, California, USA; Quai Branly Museum Paris France; Kluge-Ruhe Aboriginal Art Collection at the University of Virginia USA; and Musee des Arts Africians et Oceaniens, Paris. * The artist is thought to have been born in the late 1950s, but the actual date is uncertain as calendars were unknown to him and his family at the time. ** “Lost tribe happy in modern world” by Nigel Adlam Herald Sun Melbourne 3 February 2007. *** “An Artist’s Dizzying New York Moment by Randy Kennedy New York Times 18 September 2015.